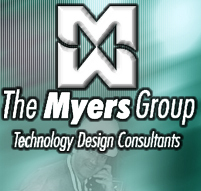 The Myers Group is an independent technology and telecommunications consulting firm. Since 1991, we have planned, designed, and managed hundreds of technology and telecommunications projects. We sell no hardware or software, nor do we maintain any ties to service providers, equipment manufacturers or any particular architect or engineering firm. This independence allows us to specialize in technology and bring limitless creativity and flexibility in crafting the most appropriate technology solutions for your organization. All content � The Myers Group, LLC 2004 and may not be used or duplicated in any way without the written permission of The Myers Group.